Waymo published photos of the minivans on Monday. 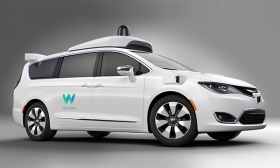 Waymo, Google’s new autonomous-technology unit, will debut its self-driving Chrysler Pacifica at the Detroit auto show. The minivan, co-developed with Fiat Chrysler Automobiles in a plan to deploy a fleet of 100 autonomous vehicles, will be displayed on stage during Waymo CEO John Krafcik’s keynote address on Sunday, Jan. 8, as part of the Automobili-D event happening the day before the Detroit show’s press days begin. In a tweet today, Krafcik said he will discuss the vehicle and details of what Waymo has been working on since October 2015, when it completed the first driverless ride without a steering wheel or brake pedal on public roads. Waymo published photos of the minivans on Monday, adding that it plans to have the vehicles on public roads by 2017. Waymo was formerly known as Google’s self-driving car project, which was spun off as a standalone company under the Alphabet umbrella.